McGill has moved up in the prestigious Times Higher Education-QS world university rankings for 2009, placing 18th, it was announced earlier today in London. 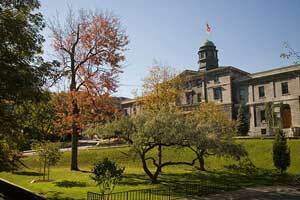 It’s the sixth year in a row McGill has ranked in the Top 25, the only Canadian school in that elite group. Climbing higher this year reinforces the University’s position among the upper levels of higher learning worldwide. Previously, McGill has placed 21st, 24th, 21st, 12th and 20th. “I am delighted to see that the University has once again been recognized as one of the world’s leading institutions of higher learning,” said Principal and Vice-Chancellor Heather Munroe-Blum. “This is a truly remarkable achievement that speaks to our continuing dedication to performance, the important accomplishments of our world-class faculty and staff and our truly outstanding students and alumni. QS Quacquarelli Symonds is a leading global career and education network, which, in collaboration with Times Higher Education, a comprehensive website devoted to higher education jobs, news and resources for university professionals, produces respected annual rankings of the top universities. This ranking is a composite indicator that integrates peer review and opinion with quantitative data. Forty per cent of the total score is based on academic peer review. Another 20 per cent is awarded for research excellence and impact as measured by citations. A further 10 per cent is derived from a survey of active graduate recruiters for major employers, who respond to questions about institutions from which they prefer to hire. A university’s staff-to-student ratio – a classic gauge of a commitment to teaching – is also worth 20 per cent. Finally, the survey allots five percentage points for number of faculty who come from other countries and a further five for percentage of international students. In total 9,386 academics (compared with 6,354 in 2008 – an increase of 47 per cent) and 3,281 employers (compared to 2,339 in 2008 – an increase of 40 per cent) responded to the surveys, reflecting the growing influence and importance of the rankings. Again, this year, McGill placed 10th in the world in the Life Sciences category.